How to configure router as switch? Most likely you will ask this question if you plan to expand you home network, and you have only extra Ethernet router but not switch. At the same time you try to make use this extra router if possible without paying more on extra switch. Well… It’s pretty simple to get it done, keep on reading. 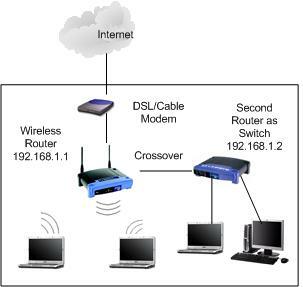 As you can see from 2 examples below, we can use second Ethernet router to expand existing wireless network or Ethernet home network, so that you can connect more computers to your network. Please note that first and second routers must be located on same network, because the second router just acts as a switch, not router anymore. Ok. Let’s start to configure second router as switch. 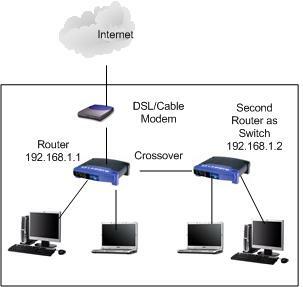 1) Connect first router’s LAN port to second router’s LAN port by using a crossover cable. If one of the routers supports auto MDI/MDI-X feature, you can use either straight or crossover cable. Remember, don’t make any connection to second router’s WAN or Internet port. 2) Ok. Now assuming your first router's LAN IP is 192.168.1.1 with subnet mask 255.255.255.0, and then this will act as gateway for entire network (including the computers that connect to second router). If you would like to enable DHCP, then just enable the DHCP setting on first router and it will act as DHCP server for entire network (you don't need to enable DHCP on second router anymore). As an example, you can enable DHCP with IP range 192.168.1.2-250, subnet mask 255.255.255.0, gateway 192.168.1.1, DNS servers 208.67.222.222 and 208.67.220.220 on first router. 3) After talking about first router's configuration, proceed to log on to second router’s configuration page, then give this router an IP by configuring an IP and subnet mask under LAN setting. The IP that you configure should be located on subnet same with first router's subnet and this IP is not being used by any other device. If you have configured first router’s LAN IP and DHCP setting as shown in step 2 above, you can easily configure second router with LAN IP 192.168.1.251, 192.168.1.252 or 192.168.1.253 and subnet mask 255.255.255.0. 4) After that, don’t enable DHCP or any other settings on second router. If you have enabled DHCP or other settings, disable them. Finally SAVE all the settings. And now your have completed your mission of making second router as switch. 5) If you have computer that is configured to obtain IP automatically, connect it to other LAN port of this new "network switch", then it should be able connect to network, ping router IP and access to internet. Note: If still not working, turn off all routers and computers, restart first and second routers, after that turn on other computers and test again. Return to top of "How to Configure Router as Switch"! !